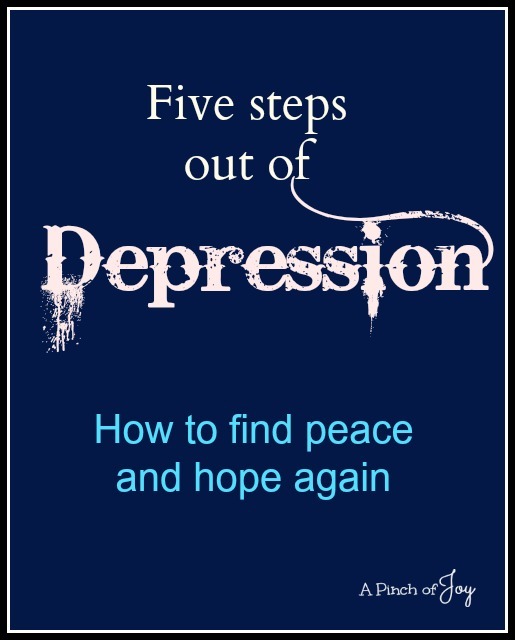 Depression is real and as devastating as any other disease. Depression is more than a bad hair day. Or a rainy vacation. Problems take over. Hopes and dreams are lost. Things will never be the same. The world no longer makes sense. Bone deep sadness that lingers for weeks. Here are five things I learned following my auto accident that helped me find my way back through the darkness of depression. 1. Seek help. This is hard. Do it anyway. It is the first step to getting better. You wouldn’t ignore cancer. It won’t go away by itself. Neither will depression. Talk to your doctor. They will prescribe medication, if necessary. It is not a sign of weakness. You won’t become a drug addict. You may try different medications or combinations. Talking to a trained counselor may be helpful on its own, but is certainly helpful when medication is prescribed. You may visit more than one counselor before finding one that “clicks” with you. This is the place to deal with overwhelming emotions, to vent, to find encouragement, new perspectives and understandings. The focus is on your current situation. They will not try to make you over or spend time delving into your childhood. Support groups can also be very helpful, both in terms of providing information and a supportive environment where everybody is going through something similar — a place where other people “understand” what you are going through. A positive leader is key. That advice often given about going to your pastor: Talk with your pastor about spiritual concerns, by all means. In larger churches, there may be a licensed counseling pastor on staff with payment on a sliding scale. In most churches, a single pastor is shepherding many people and programs, putting in long hours of service. Take it from one who has been on church staff, a pastor may have tons of empathy and desire to help, but training and time are limited. If your church has volunteers coming through the office frequently, privacy may be limited as well. Instead, use your pastor as a resource for finding a counselor, especially if you have been depressed for a while or have suicidal thoughts. Pastoral training is generally aimed at life event/ crisis intervention and short term counseling, 3-5 sessions. Most have information on various agencies for low cost or free services as well as private counselors and will have worked with many of them..
2. Remember everyone has something challenging in their life. It is not necessary to share every detail. Even though that is what you want to do. So they “understand”. Only they won’t. A short three or four sentence update will suffice. This allows others to ask questions or move on. Do not be offended if they move on. You do not know what bad news they may be dealing with. People do understand the challenge. Because everyone has something challenging in their life. Or has had. Instead, give your friends a chance to take your mind off your problems. You’ve heard about the bucket and the dipper. Jack came along and snarled at me – he took out a dipper full of joy. Jill came along and said hello with a smile – she put a dipper of happiness in. Jack Spratt came along and told me about his medical problems, the fight with his wife, the stupid politicians who run this place, his neighbor’s bad habits and totally emptied my bucket. Going over your problems time after time, also empties your own bucket. And it keeps others from being able to add to your bucket because you aren’t letting them near it. Friends offering specific help are priceless. One woman I barely knew made sure our son made it to Scouts for an entire year. She only said, I heard about your accident, I had someone help me out once and I will pass it on to you. No questions, no stories exchanged, no strings attached. There were many, many other such incidents. Each was a handhold and a step up that climbing wall to light at the top. I will be forever grateful. When you are better, you can be that friend. 3. Take care of yourself. Literally. Make yourself and your loved ones priority. Jobs are also priority and what you do will depend on your personal situation. You will have limited energy, both physical and emotional. Reduce your commitments. Do not share your limited resources with PTA, women’s club, or anything else. If you belong to a public group that will not accept “no” or “not now” as a reasonable answer to a request, leave. If your depression is from physical issues, follow your treatment and medication plan. Make time for haircuts, exercise, eating regularly. Chocolate. Cuddle with your pet. Missycat always knew when I most needed a lap full of purr. Limit newscasts to one half hour a day, not at bedtime. Or not at all. The world will go on. Avoid all negative entertainment. Listen to your favorite music. Practice relaxation. Wheels did exactly the right thing. He listened, he did extra duty housework and parenting and he told me he would hope for both of us. He did not take on my problems. There were times I wished he would “take care of me” and make things go away. He couldn’t, of course. He went with me for crucial appointments and otherwise trusted me to do what I needed to do toward recovery. And that made me strong enough to do what I needed to do. Even when it was in half hour increments. 4. Treat your significant other well. The anger you feel is not really at your spouse (or the neighbor, or the kids’ teacher). It is at the fact your life is upside down. Talk to your children in age appropriate ways about the changes in life at home. Tell them that you love them often. We did our best to keep their life “normal”, and talked about the disappointments that came when we couldn’t. Keep talking to your significant other. A hug a day is mandatory, whether you feel like it or not. It is good for them. And for you. Ask for help when you need it. Say “please” and “Thank you.” Do something together once a day – folding laundry counts. So do walks around the block. Keep finding things to appreciate about them. Write them down. Refer to them often. Share them on a good day. Or a bad day, if the good ones are too far between. Wheels never complained. Not once. That is still at the top of my list. 5. List at least three things each day for which you are grateful. Some days you will have to really dredge to come up with three– enough milk for cereal. A clean potholder in the drawer when you needed it. Anything appreciated, no matter how trivial, is fair game. Then one day you will write something small that will change your world. My physical therapy treatments started with 20 minutes on ice. I HATE cold – and, apparently, so did other patients, as wonderful heated blankets were also provided. One day, the aide asked if I were okay before she left the room. I said I needed a teddy bear and I could take a nap. Next time, she totally broke the rules and smuggled in her son’s little teddy bear to loan me. That made my grateful list. And every time I reread it, I was reminded that this busy college student cared enough to bring in a teddy bear just to see me smile. It became a turning point. That turning point was a long time coming and it was not the end of the struggle. But it came. And this is what I would tell anyone contemplating suicide as I did. Your life seems hopeless now. It may have looked hopeless for a long time. You may have gotten even more bad news. Just breathe. One breath at a time. Do I wish things had been different? You bet I do. Do I mourn the abilities I used to have and the lost potential for all of us. Absolutely. You will not hear me say that accident was the best thing that happened to me. It wasn’t. But we made it through. Nine years of physical therapy and . . . . . Just one step at a time. You see, things change. Bad news takes a while to process. You know things will never be the same – but not the whole story. In medical instances, doctors have to be realistic and paint the picture they most know – usually it is the worst case scenario. The whole story for you may be a lot better, but it takes time to know that. Medical treatments and technology change for the better. New discoveries are made in diagnosing and treating. A prognosis can change. Mistakes may have been made that can be rectified. There are people who care for you, broken as you may feel. Their world will be shattered forever if you make an irreversible choice. You are loved. You are stronger than you think you are at the moment. You are more adaptable than you think. You will find a way through the maze. You will find joy in someone’s smile again. You will actually enjoy the sunset one evening and it will catch you by surprise. There are still precious memories to be made. It is very hard to tell a caterpillar that the future will be wonderful. That it will no longer get around on its belly, that it will find a cozy cocoon and then burst forth as a butterfly. I am no butterfly, but things definitely looked up. One day at a time. Great post! You hit on so many wonderful points. Thanks for sharing at Project Pin-it!